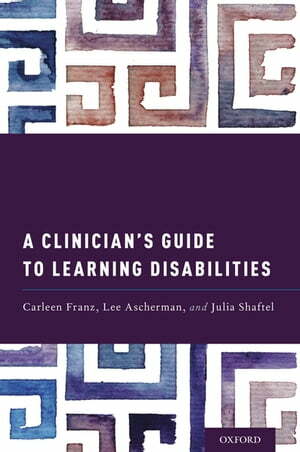 Collins Booksellers - A Clinician's Guide to Learning Disabilities by Julia Shaftel, Lee Ascherman & Carleen Franz, 9780190671730. Buy this book online. The Clinician's Guide to Learning Disabilities provides a succinct description of the various types of learning disorders that affect educational achievement, illustrated with numerous case studies and supplemented with clear descriptions of educational assessment best practices and score reporting. Interpretation of psychoeducational reports is clarified for clinicians who seek guidance on how to make sense of many types of test scores. Current diagnostic practices for DSM-5 and IDEA are compared and contrasted. An entire chapter on the legal background of learning disabilities provides guidance on supports for students with learning disabilities in all settings. Chapters on preschool assessment and the transition to post-high school college and career expand the scope of the book beyond the school years. No other book describes learning disorders and the psychoeducational evaluation process for mental health clinicians who work with these children and adolescents. A chapter on referral and collaboration will inform clinicians who seek deeper educational knowledge about their clients to better guide students and their families.